Buy Anno 2205™ Tundra (DLC1) and get the games download now! NOTICE: Requires the base game Anno 2205™ in order to play. Uplay account and internet connection are required to activate, download and use this product. 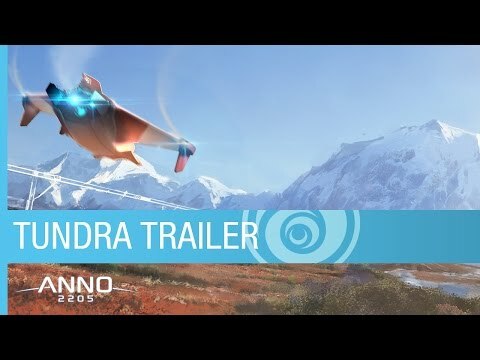 Anno 2205: Tundra allows you to discover a long forgotten region…the desolated Vanha Plains. In this land where nobody set foot for 100 years, you will gather new resources and complete specific quests to further improve your metropolises. In this new 82 000 acres territory, you will discover new gameplay tactics as you need to dry the marshes before settling in the area among the muskoxen and the icy environment. Two new population types are also available, the Tundra Scientists and the Tundra Protectors. Five new production chains and ten new goods will challenge you to use your management skills effectively. A new additional module type can also be unlocked by solving the sector quest and inquiring on the past generations failures. This module improves farms and factories in the Tundra sector, but also in all the others regions of the game. Throughout the story quests and optional side quests you will control a futuristic flying vehicle to hover over the desert landscapes. Also ten new achievements will bring you even more additional challenge!